Most homeowners would definitely love to have a bright kitchen. The kitchen is not only where we prepare our meals; this is where family members usually come together and chat while enjoying some snacks. Also, imagine having breakfast with your loved ones in a kitchen filled with sunlight. 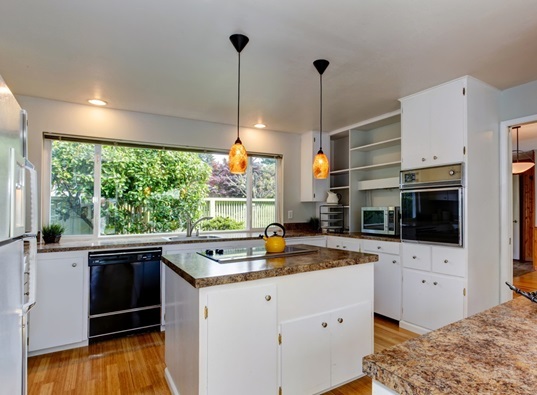 Top it all off with a wide view of your surroundings, and you’ll love your kitchen more. This is a popular window style used in kitchens around the country, as casement windows are easy to operate and provide excellent ventilation. Kroll Construction’s casement windows are made from vinyl, which is easy to maintain and lasts long even against tough weather conditions. These two beautiful windows styles have a lot of similarities. Both are made up of three or more window panels and are installed protruding from exterior walls. The only difference between the two is the shape—bow windows are semi-circle while bay windows are angled. Bay and bow windows can make any room brighter because of their size. As these are usually made up of three or more window panels, these offer more glass surface. Installing any of the two in your kitchen will provide you with a panoramic view of your surroundings. It will also allow in an ample amount of sunlight into your kitchen. The best part about these window style options is the extra space these offer. As bay and bow windows are installed projecting outward from the exterior walls, these provide an extra space where you can set up a small nook for a breakfast table or a cozy sitting area. This special type of window is designed to bring a little nature inside your home. It is typically made up of multiple panes of glass in a box shape and installed protruding from the exterior walls. This small “glass box” resembles a miniature greenhouse, which you can use to grow plants and flowers in your kitchen. You can even use this extra space to grow fresh herbs and spices for your cooking needs. Due to their multiple glass panes, garden windows let you enjoy a great view of the outdoors from your own kitchen. Among the many window companies in Michigan, only one can ensure a wide range of high-quality replacement windows and professional installation every time. Kroll Construction is the number one choice for all your window needs. Call Kroll Construction today to learn more about our company, products, and services. You can also fill out our convenient online request form to schedule a FREE consultation and estimate.